Does anybody still dance the limbo? You know, you bend over backwards to shimmy under an ever-lowering pole, to the catchy strains of calypso music. Don't know if any actual Caribbean peoples did the limbo, but plenty of post-war suburbanites who'd sipped a bit too much rum sure did. 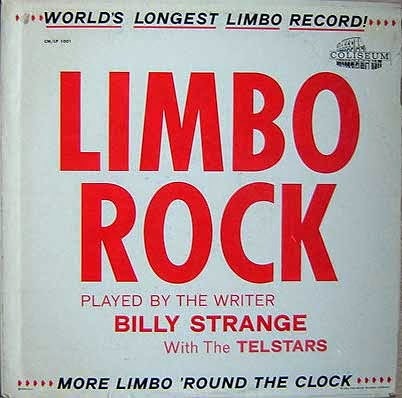 And this has to be one of the strangest artifacts of the limbo craze - a instrumental version of the hit Chubby Checker song "Limbo Rock" stretched out for the length of an entire album. Hollywood session vet Billy Strange (that's his guitar on Nancy Sinatra's "Bang Bang," among a million other credits) and his crew keep things interesting throughout, with funky percussion breaks, and exotica-like atmospheric interludes featuring grown men a-whoopin' and a-hollerin'. There's plenty of soloing, ranging from cool jazzy to almost rock 'n' roll. Exotica music is fine and dandy for polite cocktail sipping, but when the drinks kick in, what are you gonna dance to, eh, eh? I'll tell you what: "Limbo Rock pt 1" and "Limbo Rock, pt 2". For those moments when you want to, quite literally, drink someone under the table. You've never been to Burning Limbo Man? What about Limbopallooza or Gathering of the Jaggalimbos? Wow...that soprano sax player is taking it way, way "out." Of course Soylent, not to mention the hit tv show "Limbo Dancing With the Stars." Seeing Oprah slip under that bar less than a foot high was quite a sight. I know what you mean anon, that's why I prefer side 2- it's as close to avant-garde jazz as middle America was likely to encounter.